“The trick is to NOT get confident, because then you overestimate your abilities.” —Anna Eriksmo on accepting risk. Words cannot describe the challenges and landscape of Kima Trophy. It is among mountain runners a unique opportunity to attempt this challenge in the heart of the Italian Alps. The 52 (33mile) course ascends 4200m (13.7k feet) of alpine terrain at an average of 2800m (about 9200 feet) elevation. It traverses through 5 mountain passes with fixed protection necessary to climb and rappel in 7 of these areas. Between these funnels, the path picks its way through boulder fields and high alpine pastures, connecting many mountain huts or “rifugios.” This path, called Sentiero Roma, was made into a race named for a famous Italian mountaineer, Kima, who died during a tragic alpine rescue attempt. For the typical hiker, the route could take several days at a more relaxing pace. But Kima Trophy is a challenge for the most courageous mountain athletes and has strict time parameters that typically end the race for about half the racers. Three time checks stop runners at 2.5h 6h and 8h. And for the finish, athletes are allowed 11 hours. 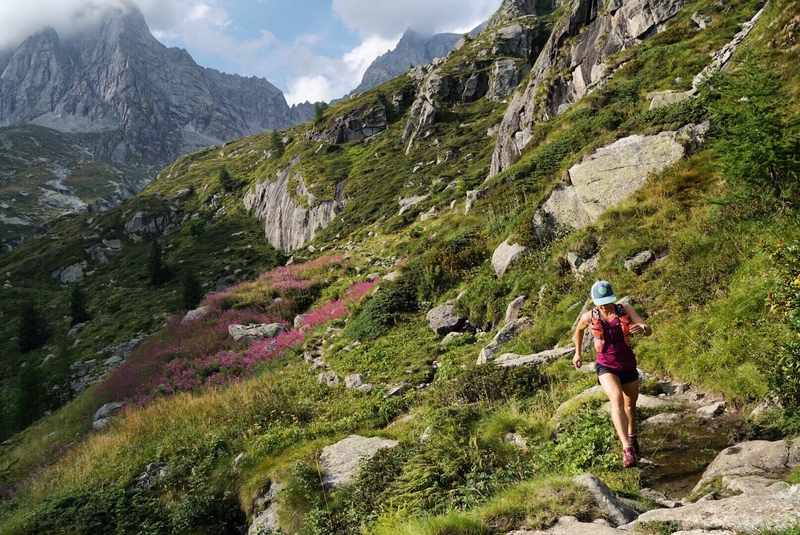 Kima Trophy is a fascinating study in the growing popularity of mountain running in extreme terrain as well as increased participation by women at these kind of races. During 2018, Kima was rumored to receive applications from nearly 2500 competitors to participate. The organization based selection of the 250 athletes allowed to compete on previous Skyrunning experience in extreme and technical terrain. Of these, 44 women were selected to compete, 36 started, and 21 finished. Among the women finishers, eleven countries were represented. Prior to 2018, the highest number of women to finish Kima in any year was 13 in 2016. Since becoming a biennial race in 2008, Kima has seen 67 women finishers under the current cutoff time of eleven hours. Now a decade later, the total number of women finishers in the 2018 edition nearly doubled from previous years. This field made up nearly 30% of all women finishers of Kima in the past 10 years. It appears there have only been 4 women from the USA who have finished Kima and three of them finished this year: Hillary Gerardi, Brittany Petersen, and myself. two of the American women finishers won the race: Kasie Enman in 2014 and Hillary Gerardi in 2018. Since the races beginning there have only been 16 finishes by women under 8 hours. Three of them were by the US women, Gerardi in 7:37 (seconds from the course record), Enman (7:53) and Petersen (7:58). An outstanding demonstration of the growing caliber of athletes running mountains in the US. It also appears that only 3 men from the United States have finished Kima. Cody Lind holds the fastest time for American men in 6:48. In a year when I’ve had nothing but obstacles in pursuit of fitness for Kima, I’m pleased and amazed that I was able to finish. I was able to rely somewhat on the past four years of Skyrunning experience. But also, I spent most of my training months pursuing new and more difficult terrain in the Northern Rockies to challenge my comfort in rugged, exposed areas. Kima is an opportunity to push yourself to the limit in the mountains and it requires training like no race I’ve ever done. By no means was it an exceptional finish, but based on the stats, I had a 50/50 chance to finish and I’m stoked I made made it, even if it was so close. Approaching the first pass, the sun shines on several mountain rescue members, who bravely manage the wind and cold temperatures in rustic stoicism, layered with bright down jackets, harnesses and lightweight helmets. “Bravo!…BravA!” They correct as they see I am a woman. I switch my gloves for a thicker pair with more protection in the palms. We are approaching the first descent that will require fast-roping down a fixed chain. In these areas, the ground is steep enough to require the use of protection for safety. But to decrease risk of exposure to hikers who do not carry ropes or harnesses, fixed chains and footholds are bolted into the rock. We turn towards the rock grasping the chain in both hands and lower ourselves over the vertical sections smearing our shoes on small cracks and crevices in the vertical rock. Between passes we make our way as swiftly as possible running shorter sections when there is a path in high alpine pasture or the rocks have been beaten into a more defined course. But mostly it is hopping from boulder to boulder, large granite blocks at every angle occasionally painted with the red and white stripes indicating the path. Much time and energy is spent finding the way and directing the body safely over obstacles. Eventually the passes require use of chains on the uphill as well to climb safely, with the way being extremely steep and unforgiving, a fall or loose rock would likely be fatal for the climber or anyone below. Ascending is more natural but requires more arm power to pull up. Many areas are wet or loose and using only one hand on the chain is very unsafe. So we pull up with both arms and find footholds in the face of rock, without looking down or around as there is no levity for enjoying good views. By the second descent I feel more confident with the chains and the route but these areas require racers to move cautiously as others are below and above navigating their own obstacles. During the second rappel while facing the rock looking down for safe footholds. I use the three points of contact rule and try to only move one point at a time. But I feel the chain yanking and it snaps my knuckles against the rock. I look up swiftly and see another woman who I’ve passed earlier on the ascent trying to pass on the most harrowing part of the descent. Her feet are slipping toward my face. I gripped the chain more strongly, stop, and stay still as she climbs around me. Startled and slightly heated I can’t imagine why anyone would pass in the worst, most dangerous place. She appears to be risking herself and everyone else on the chain for a couple seconds off the finishing time. By the time I get down the slippery, steep descent and back into the boulders the path reaches some runnable sections in pasture. Again on the ascent I’m close behind her and could easily pass. I stay behind though this time because clearly she is a very confident descender. At the top, again the path is runnable and she is walking, looking tired with her hands on hips. I see no more rappel and take this as a sign it’s okay now to pass. This builds my energy as I feel the most dangerous part of this race may be behind me: another person. With the day warming and with some of the most difficult climbing behind me I push harder. I’m now halfway though the course and it’s been over five hours. My supply of food is growing slim and I’m unsure how much further I have to go. The next ascent is the longest and most dreadful as I’ve grown low in energy and my steps are not so precise, my grip no longer very strong. By the time I reach the top I’m pretty exhausted. A slot in the ridge houses a few alpine guides with harnesses and helmets watching out for our safety. A sign reads “DANGER!” And I realize here again I must rappel down. This time I’m slow and steady knowing I’m my own worst enemy on this descent because I have pulled the dire mistake of not bringing enough supplies. A man in front of me is working his way down and I can tell by his short, forced exhales he is very anxious. I try to go slowly and give him time. “Good job!” I say brightly, “you’re doing great!” About this time, I feel the sharp jerks on the chain again. Here is this woman, sliding down, one hand on the chain, working her way toward peeling us all off the rock. “REALLY? !” I exclaim this time. I mumble something like, “I doubt you’re even in the top ten I wouldn’t worry about it.” In fact, I knew most of the top finishers were likely already closing on the finish line. The two of us would be lucky to finish under 11 hours without getting hurt. I pass her again as soon as we hit the bottom of the rappel. Then I watch, flummoxed while she desperately cuts every runnable switchback down, skidding and stumbling, passing me in the process. In America, cutting switchbacks is highly frowned upon for many reasons so I was a bit surprised again by her boldness. We ascend and descend another pass and in the distance I see a rifugio. I glance at my watch which reads 4pm. We have been moving now for 7:50 hours. And I remember there is an eight-hour cutoff somewhere in this vicinity. A man comes up behind me and I ask him if he knows if this is the place. He affirms it is the cutoff and I realize we are still over a kilometer away. Between us and the hut is a steady climb over boulder path with a stream and a herd of sheep. I finally realize, this is what she meant. She knew we would be pressed for time to make this time cutoff. Several meters later the man behind me counts down, “Three minutes!” We are huffing. “Two!” I reply a bit later, breathing hard and pushing legs forward up the boulder path. we approached the hut and bystanders were chuckling and cheering at our efforts. “One minute!” The man says behind me with desperation. She looks very relieved and grasps my hand. I can tell she is older than me and I realize her efforts are very inspiring. Making this cutoff for a woman is very difficult. With the two men we are the very last racers to make it. Never before have I been in this position, so close to cutoff but without her pushing and the man behind I would not have known I was in such a tight spot. In the end we all finished, the last of about 140 of the 250 selected runners who were able to pull it off. Retrospectively, I can see many opportunities for improving on my time and abilities in this kind of terrain. But again, just being able to participate in Kima is an honor. Anyone should feel satisfied to push so far outside their comfort zone to train for a true alpine mountain running race. There is nothing else like Kima in the world that I know of. I feel especially pleased to grow so much during the process. It’s rare that a race can leave a runner feeling like they’ve risked their life and left it all on the line. But I’m also happy to finish as one of the few women to complete this pinnacle of Skyrunning. My hope is to continue to see the competition grow, and participation by women runners grow, as well as watch the caliber of women athletes continue to raise every year. So glad it was worth the read! Thanks for following along 😊 you were all there with me in spirit!